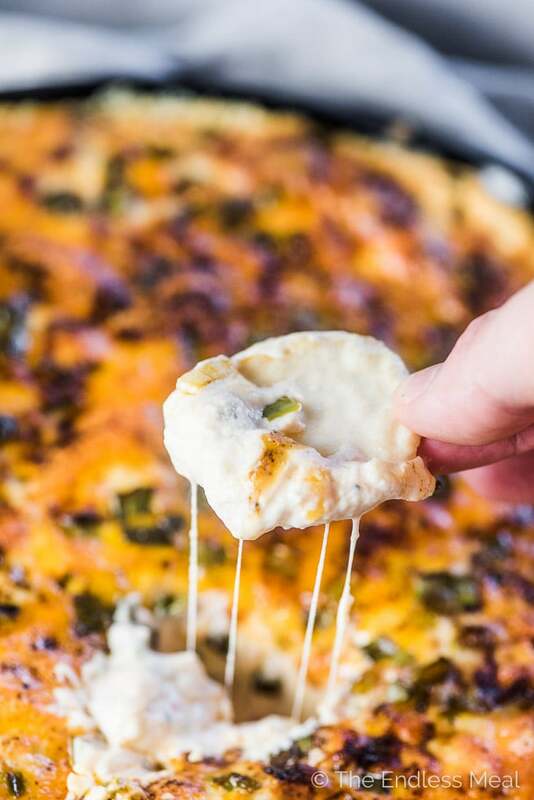 Jalapeño Hot Cheese Dip is everything dreams are made of. Super cheesy and creamy with just the right touch of spice makes this a true crowd pleaser. Bonus: it's crazy easy to make! We've eaten it a few times over the past week and love it more and more each time. Armed with some broccoli and peppers and my two-year-old girl will make a serious dent in this hot cream cheese dip. It's super creamy and light thanks to my trusted pal, PHILADELPHIA Original Cream Cheese 250g. That's right, friends, PHILLY what I always reach for when making a hot cheese dip. Just like your fav jalapeño poppers in dip form. 100% no-fuss appetizer recipe. Did you watch the video? It's SO EASY to make. Totally do-ahead-able. Pour the cheese dip into an easy to grab, ovenproof container and bake it whenever you're ready. It also transports really easily so you can bring it to your friend's get together and pop it into the oven when you arrive. This hot cheese dip is vegetarian, gluten-free, and low carb which means that everyone will love it. What to make with PHILLY Cream Cheese? Do you remember last year when I shared that (super cute!) recipe for Cranberry and White Chocolate Mini Cheesecakes? I made them with PHILADELPHIA Cream Cheese, too. Philly is always my go-to cream cheese for holiday baking and entertaining. It's light, smooth, and has no artificial colors or flavors. Not only great for desserts, but savory recipes as well – the versatility is such a bonus! 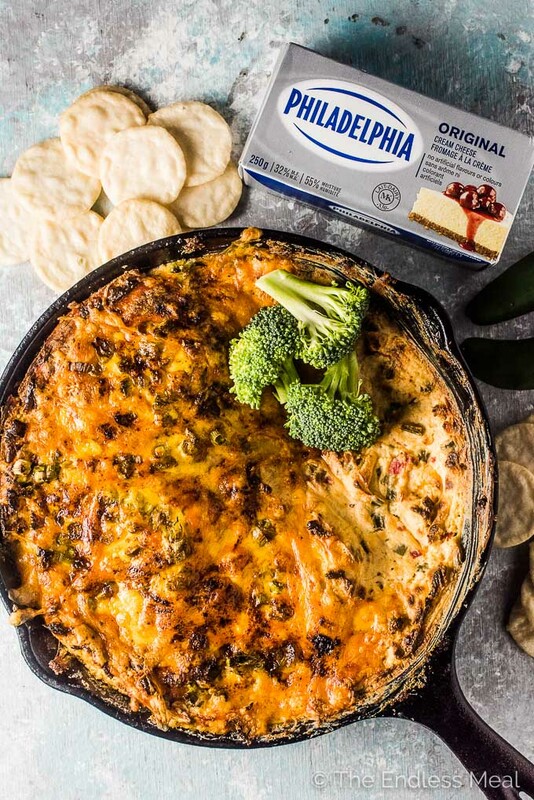 Make sure to check out the Content Hub HERE and Kraft Canada for more delicious recipes and a complete list of Philadelphia Cream Cheese products. 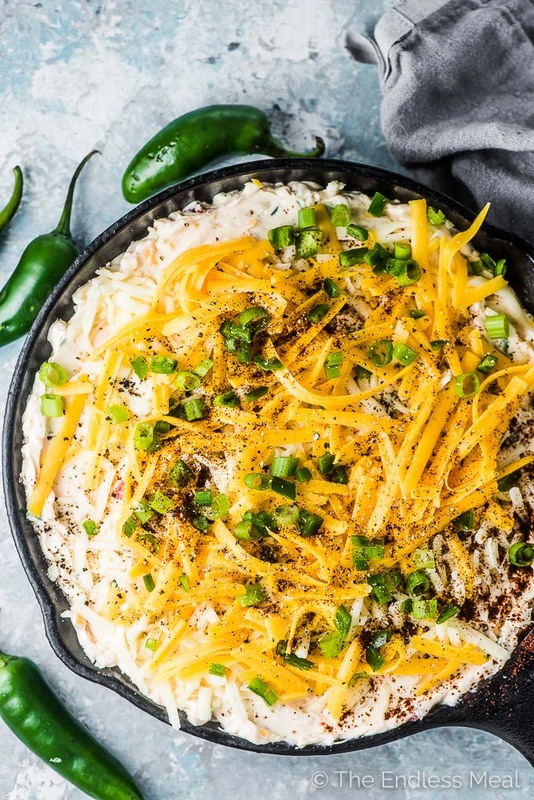 This hot cheese dip recipe is as easy as 1-2-3. Gather your ingredients. (I'm looking at you, light and fluffy PHILLY), jalapeños, pimientos, a few spices, and some cheese and sour cream. Mix them together until they're smooth then pop them in a baking dish. Don't forget a little extra cheese on top! That's it! Now all you have to do is gather your dippers and dig in. Unless you're serving this to a group of low carb/ keto pals, crackers are a must. The crunchy cheesy combo totally wins. My favorite are gluten-free rice crackers cause they're extra crunchy. But don't forget the veggies! 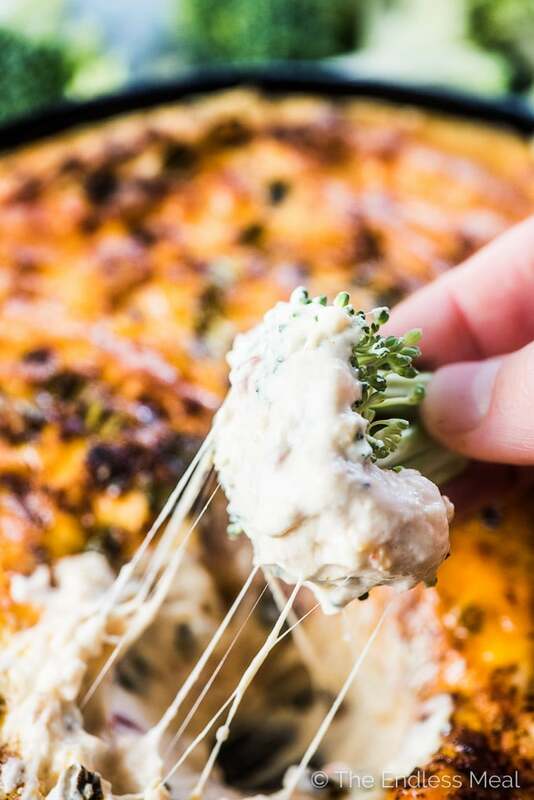 This hot cheese dip goes really well with veggies and you'll be surprised how many times you find yourself reaching for a piece of broccoli or some celery to scoop the cheese. We all know that veggies covered in cheese sauce are magical. Dipping them in a hot cheese dip is pretty much the same thing only way more fun at a holiday party. 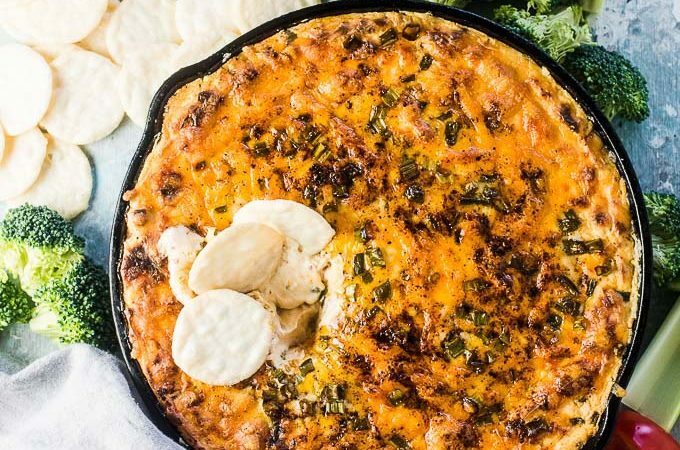 I'm about 100% certain that this hot cheese dip will be making an appearance at every Christmas party this season. If I watched sports, I'd bring it to all the game day parties, too. Do you have a favorite hot cheese dip recipe? And do you always reach for a brick of PHILLY when you make it? Add the 2 packages PHILADELPHIA Cream Cheese, yogurt or sour cream, 1 1/2 cups of mozzarella, 1 1/2 cups of cheddar, pimientos, most of the jalapeños, most of the green onions, garlic powder, paprika, salt, and pepper to a large mixing bowl and cream together with a spatula, wooden spoon, or electric beater. Pour into a 9″ cast iron pan or baking dish. Smooth the top and sprinkle with the remaining mozzarella, cheddar, jalapeños, and green onions. Bake for 20 minutes then broil for 5 minutes. Let the dip cool for a couple of minutes before serving. 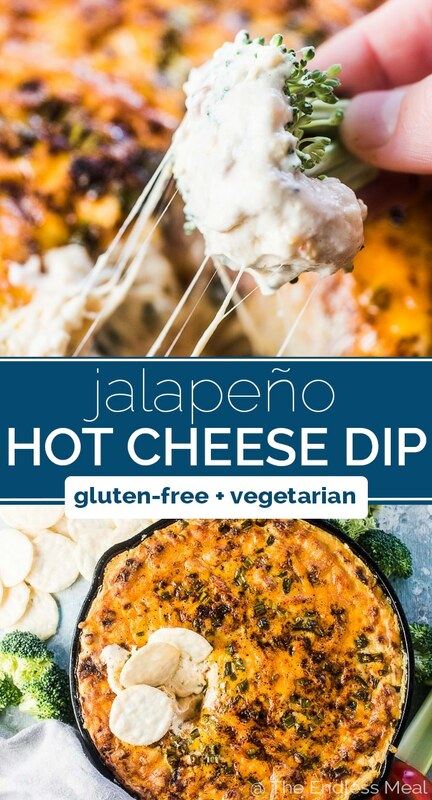 Serve this hot cheese dip with regular or gluten-free crackers or (my favorite!) assorted veggies. Check out Kraft Canada for more delicious recipes and a complete list of PHILADELPHIA Cream Cheese products.